How often have you watched a world Aid advert or seen on the news volunteers rebuilding communities destroyed from natural disasters or war. Have you ever said to yourself ‘I would love to be able to volunteer “give back” to the underprivileged…but you just didn’t know how or used BUT ‘I’m just too busy at work’, ‘I wouldn’t know where to start’, ‘I have no one to go with’, ‘it’s not safe’ …then done nothing about it? Now you can stop talking about it and do it! We make it easy for you to have a real cultural experience where both you & the community benefit from your experiences, to travel worry free and have the adventure of a lifetime while benefiting the life of another! 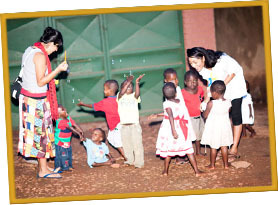 If you are one of those passionate volunteers who likes to spend their holiday period rolling up their sleeve to make a difference in the lives of others, then please reach out to us as we would be happy to help organize a trip for you that will engage you and your loved ones in a planned volunteer trip of a life time! We will work around your schedule and interests to customize a trip that will not only cater to your love for giving to others but will also have real impact on the lives of those whom you will be helping. While we greatly appreciate your hands-on support, we also believe it is very important for all our volunteers to offer a nominal monetary contribution, 100% of the funds to be used to help us elevate the lives of all our children buy covering their living expenses. As such, we kindly request that for each (1) day of volunteering, the volunteer contributes (1) day’s value of living expenses for our home which is $130. So if you volunteer for more than one day then you would multiply $130 by the number of days you will be volunteering with us. Since we are a fully audited and financially transparent organization, we will issue a receipt for your cumulative monetary contribution which will then be reflected in our financial reports as a donation to our home. In order to be fair for all of our volunteers, we will not be able to accommodate any special family and friends requests to waive this amount. We would like to thank you in advance for your generous support!